Martial arts practiced by Canadian landscape artist Dominik Modlinski and his teachers, karate, wing chung, Japan, Okinawa, Shorin Ryu. Dominik’s journey in Martial Arts began at age sixteen. Upon emigration from Poland to Canada in 1987 Dominik made him self a promise to start learning Karate-Do. Within 23 days being in new country and with very limited language skills Dominik stared to practice Shorin-Ryu / Matsubayashi from Sensei Gerry Cambell of Orillia Martial Arts Centre. Just as starting a life from ground zero in a new environment, a journey from white to Black Belt required a total dedication and persistent study. When Dominik moved to Toronto to pursue his studies in fine arts at Ontario College of Art, he continued studying Karate-Do under Sensei Ken Sullivan ( Chito-Ryu ). For next four summers Dominik returned to Sensei Gerry Cambell dojo where he finally earned a 1st degree Black Belt. Since Dominik travels a lot, it was a natural extension to take his gi with him everywhere he went. It allowed him to practice with many wonderful people across the globe and build up his martial arts skills. In the last year of college study in Toronto Dominik joined a Japan Martial Arts Centre (headquarters of the International Karate Association of Canada) under Kancho Takemasa Okuyama 9th dan where he practices till this day. During his time in Atlin, BC, (1997- 2001) Dominik opened his own dojo teaching karate to children and adults. It was a full success by adding regular physical training to this small northern community. In 2001 Dominik moved to Calgary to pursue his professional career and trained at Alberta Chito Ryu Association. In 2006 Dominik moved to West Coast, Vancouver and started training Wing Chun under Sifu Fred Kwok. Wing Chun was a style that Dominik was always interested in and it was a great addition to his skills in Karate-Do. In 2008 Dominik had an opportunity to move to Nanaimo, Vancouver Island where he paints full time and explores the island for his many painting adventures. In Nanaimo he continues to train Wing Chun under Sifu Bob Stevenson who is a 4th generation instructor under Paul Lamb/Leugn Sheung/Yip Man himself.. In January 2010 Dominik recived 5th degree Black Belt ( Shihan ) from Kancho Takemasa Okuyama. From 1972 to 1984 Sensei Gerry Cambell trained in Sensei Quai Wong's Karate and Kung Fu Society system based in Toronto. Sensei Wong's dojo's had a heavy emphasis on free sparring with contact being the norm rather than the exception. Training in the 1970's had a far more " blood & guts " approach than is commonly seen today. Most Canadian Matsubayashi Dojo's can trace their roots to the Wong dojo. We are pleased to continue our training With Sensei Wong whenever possible. Gerry went west in early 1977, working in B.C & Whitehorse (Yukon Territories) as well as California. While on the west coast, he sought out as many Martial Arts schools as possible, seeing some of the best ( and the worst ) that the west had to offer. In late 1978, Gerry moved back to Orillia, rejoining the Wong's system. In 1980 he was promoted to Shodan by Sensei Wong. In 1984 Gerry met Sensei Chris Gilbert. Chris was a long time Judo Black Belt, who trained to win in the street, not in tournaments. After training with Chris for a year, the decision was made to open the Orillia Martial Arts Centre, with Chris teaching Judo and Gerry teaching Karate. Sparring in his Dojo became more rounded, more realistic. In 1998 he met Sensei Ota in St. Louis at the World Seminar that was held to honor Sensei Nagamine's life. His Dojo trained with Sensei Ota until April 2008. He continue to practice Sensei Ota's version of Matsubayashi Karate along with the other influences he have had along the way. His Dojo works under the principles taught to him by Sensei Ota and Sensei Wong. Every class, every Kata, every drill is devoted to making the student a better Karate student. This is a Martial Art. International Karate Associations in Canada, Argentina, Bosnia, Cehia, Columbia, Croatia, Ecuador, Hungary, Israel, Macedonia, Palestine, Russia, Slovakia, Ukraine, Yugoslavia and in India. Honourary Member of the Official International Association of Private Security Manpower, and in the North American Martial Arts Hall of Fame. Mr. Okuyama received the Key to the City of Cali, Columbia from Mayor Ricardo Cobo, for his efforts in the movement for peace, and has received special awards from the City of Be'er Sheva, Israel from Mayor Kakuv for peace work between Israel and Palestine. The martial art journey of a true karate master lasts for a lifetime. Takemasa Okuyama is an example of someone who has risen to the top of his discipline by a never-ending desire to train and expand his knowledge about his chosen art. It has taken him to five continents as a teacher and tournament official, and he is now recognized internationally for his karate instruction. Kancho (director or Principal) started training in sumo and judo as a seven year old, with his father Takemi and brother Takao, who was captain of the Nippon University Nojui Gakubu judo team. Young Takemasa Okuyama trained hard and was eventually made captain of the Hachijo High School judo team. His introduction to karate came when he was 13, through a karateka from Okinawa named Mr. Kinjo. Okuyama entered Takushoku University in April, 1960 and studied political science and received a degree in foreign trading. At the same time, he studied Karate under Senseis (Teachers) Tabata, Hamanaka, Ozawa, and Tsuyama. This university has produced some of the finest karateka and instructors in the world, and Takemasa Okuyama took advantage of his opportunity to learn. Okuyama came to Canada in 1969 and organized the IKA Canadian chapter under Soke Kubota. It was in Naha City, the capital of Okinawa, after gaining recognition as one of the strongest in his high school’s karate club; Mr.Ota was invited to join Sensei Shima’s private dojo and Sensei’s Nagamine (1907 - 1997). As a youth, Ota enjoyed playing baseball and boxing in nearby gymnasiums. Yet, his passion for martial arts became evident at an early age. Today Sensei Ota vividly remembers his training in Okinawa under Master Shima, Nagamine and, considered the toughest street fighter in the karate world...This Ota propounds, requires a different level of physical and mental commitment. Ota quietly intimates to his students that modern day emphasis on point fighting is very different from the way he trained in Okinawa. Sensei Ota, in his typical soft spoken and quiet demeanor, says that he realized that training in Master Shima’s and Nagamine’s dojo was not enough. He links this to academic studies as well. A student should attend classes, Ota asserts, to acquire knowledge, but must do homework and continual exercise outside the regular classes to hone and retain the knowledge, and martial arts is no different. Contemporaries of Ota in the Naha City dojo remember the story of how one evening a senior instructor went to Ota’s parents home because Ota had refused his promotion to Sho-dan (first degree black belt). Instead Ota was found practicing in nearby sugar cane fields in complete blackness. This was the first time people found out about Ota’s private training. Mr. Ota explained to his senior that he did not intend any lack of respect to his contemporaries or seniors at the dojo, rather it was his desire to achieve a higher potential. Mr. Ota explains that the wonderful thing about karate is that you can never fully reach a state of perfection. That is, training is a process, an evolution of knowledge and technique where the practitioner can always keep improving. As soon as you achieve a goal, there is immediately a harder one that the student must strive to achieve. Ota tells his students that complacency or the belief that you have maximized your potential or ability is the first step in your downfall. Mr. Ota constantly reminds his students of the importance of striving for more. According to Ota, getting to black belt level is relatively easy. However, most people stop there, even in Okinawa. Very few continue to develop their skills and can improve enough to move to the next level. Students of Ota’s attest that his speed and skill continues to improve over time, despite growing older, and that is what differentiates him from ordinary athletes. Whenever people complain that they are too old, they are reminded that master Nagamine is 90 years old and still trains for hours every day. Nagamine can easily throw students half his age to the floor with ease. Sensei Ota encourages students to make karate a way of life. The dojo in Okinawa is open 24 hours a day, seven days a week, even holidays. When Ota left Okinawa to pursue electronics degree at Tokyo University, he was forced to work during the days to pay for tuition, and devote evenings to study. He did not have time to join a dojo, but it did not deter him from practicing karate. 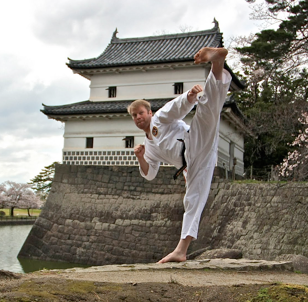 His five feet by seven-foot apartment in Tokyo became his new dojo. It is said that he would practice so hard that other residents thought there was an earthquake outside. In Okinawa, karate men tease that it is safer to be in an earthquake then to have to face up against Ota in a sparring match. In 1969, Ota moved to the United States. Yet he always kept training. His students remember that even following a motorcycle accident; Ota never missed a day in the dojo. Students when they found out about their teacher meeting with an accident replied, We didn’t even know, it is impossible to tell from watching him train! Often Mr. Ota tells injured students, if you hurt your right side, then use it as an opportunity to train with your left and build up your weaknesses. Always make yourself stronger by working on your weaknesses. In 1973, Ota opened his first dojo in the United States. Still, he remembers the training as more serious in Okinawa. Classes in Okinawa would continue until students would get blood in their urine from training so seriously. The difficult part, however, according to Ota, it wasn’t the pain, but building up the toughness to go and do the same thing again the following day! Mr. Ota married in 1975. His wife owned a sake bar for fifteen years in one of the roughest areas of central Los Angeles. It was such a tough neighborhood; police officers have been quoted as saying that the only times they felt safe was in Sensei Ota’s bar. One neighborhood police officer that later became a student at the dojo recants stories of how assailants armed with firearms would unsuccessfully attempt to hold up the bar. But, they just weren’t fast enough to handle Ota’s lightning speed. Currently one of his senior students is an instructor at the Police Academy. Mr. Ota is an expert in all the traditional Okinawan weapons of self-defense, which at one time were used in the fishing and farming industries: Nunchucks, Bo, Sai, Tonfa and Kama. Ota believes that Kobudo, the study of weapons, is an integral part of karate training, and he encourages students to practice the various weapons. Ota says that weapons training present an opportunity for students from different styles to train together because the techniques needed for weapons are the same, regardless of stylistic variations or a student’s background. Always however, the student must first learn how to take care of the weapons, because in this way they develop respect and appreciation for the weapons, and, moreover, the responsibility and control to use it. Perhaps even more than his lightning speed or the forcefulness of his techniques, what differentiates Ota from all other sensei is his mastery of distance. Ota explains that when opponents engage, they are already at a very short distance from one another. because they `have not developed a strategy to cope with combinations, fakes, feints, and shifting movements. Okinawa to conduct sparring courses because of his mastery of these strategies. Indeed, more karate masters on Okinawa feel he has taken the art of karate to levels last seen in the 18th century.